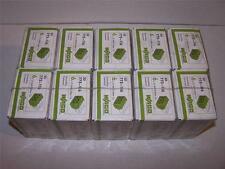 10 X GENUINE WAGO 221-412. 2 LEVER ELECTRICAL CONNECTOR REUSABLE 32A. SUITABLE FOR ALL TYPES OF CABLE, WIRE & FLEX. 50 X GENUINE WAGO 222-413. 3 LEVER ELECTRICAL CONNECTOR REUSABLE 32A. SUITABLE FOR ALL TYPES OF CABLE, WIRE & FLEX. DO NOT buy fake Chinese copies of these connectors available for a slight savings over the original. 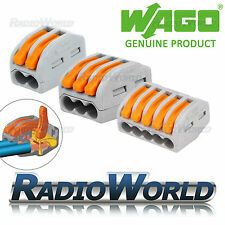 Buy ONLY authentic WAGO connectors and save future hassle! Don't see it?. Setting new standards in electrical installations, WAGO's new 'all-around' connector is smaller and even more user friendly than its successful predecessor, the 222 Series. 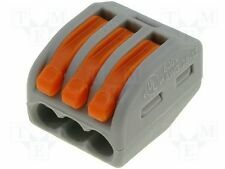 The WAGO Series 222 3-Wire Spring Connector 300V 32A Grey/Orange is the easiest way to connect and disconnect cables and wires. Nominal current 32A. Connector can accept solid, stranded and flexible conductors - no tools required. WAGO 221-413 3-Way Compact Lever 32A Connector. 3-Way Conductor splicing connectors, transparent housing, orange lever.  Wire range--flexible:0,14 – 4mm².  Wire range--stranded: 0,2 – 4mm².  Wire range--solid: 0,2 – 4mm². WAGO 221-413 3-Way Compact Lever. WAGO 221-Series 2,3,5-Way Compact Lever. Conductor splicing connectors, transparent housing, orange lever.  Wire range--solid: 0,2 – 4mm².  Wire range--stranded: 0,2 – 4mm².  Wire range--flexible:0,14 – 4mm². 50 X GENUINE WAGO 221-413. 3 LEVER ELECTRICAL CONNECTOR REUSABLE 32A. SUITABLE FOR ALL TYPES OF CABLE, WIRE & FLEX. WAGO's new 'all-around' connector is smaller and even more user friendly than its successful predecessor, the 222 Series. Connect any combination of solid, stranded, and flexible copper wires faster and more reliably. Utilising the WAGO 221 series of connectors, the mBox L32 is simple and fast to use, making it ideal for both experienced Electricians and the DIY market. MBOX L32 Wiring centre. 25 X GENUINE WAGO 221-415. 5 LEVER ELECTRICAL CONNECTOR REUSABLE 32A. SUITABLE FOR ALL TYPES OF CABLE, WIRE & FLEX. 50PCS GENUINE WAGO 3 PORT LEVER NUTS 222-413 CAGE CLAMP BRAND NEW! FREE SHIP! You are buying 50pcs 3 port AUTHENTIC WAGO 222-413 LEVER NUT. 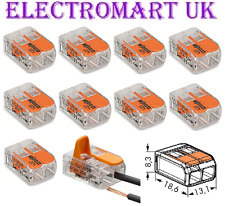 - DO NOT buy fake Chinese copies of these connectors available for a slight savings over the original. 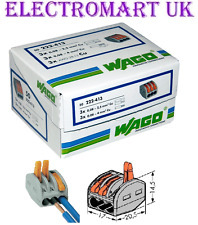 Buy ONLY authentic WAGO connectors and save future hassle! This connector allows for solid, stranded and fine stranded cables to be connected together without the need for any tools. GENUINE WAGO PRODUCT . Compact splicing connector. Solid & Stranded Conductors: 0.08-2.5mm2, Fine Stranded Conductor: 0.08-4mm2. COMPACT PUSH WIRE Connectors for Junction Boxes ®. 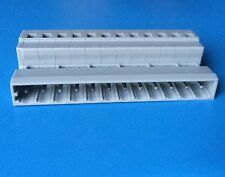 L-BOXX Connector set 887-918. Practical and saves space. 10 x mounting adapter 221-500. L-Boxx Mini. Practical and saves space. 1x L-Boxx Mini. Always at the ready. L-Boxx Mini. Practical and saves space. 1x L-Boxx Mini. Always at the ready. Set includes 15x 2273-208. 20x 2273-205. Wago LEVER-NUTS™ Cage Clamp. Wago Series: 222. Wago Product No: 222-413. Once you use these connectors you’ll never go back to Marrettes or any other twist-on wire-nut connectors. Connector Type: Cage Clamp. 10 X GENUINE WAGO 222-413. 3 LEVER ELECTRICAL CONNECTOR REUSABLE 32A. SUITABLE FOR ALL TYPES OF CABLE, WIRE & FLEX. 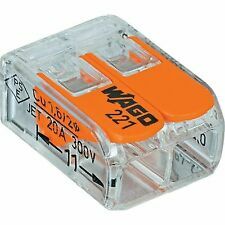 Wago 221 Compact Series, Compact Lever Splicing Connector, 4.00mm 2 Pole. The WAGO 221 Series compact lever connector allows fast wiring for solid, stranded & flexible conductors safely due to CAGE CLAMP connection. Rated current 24A. Standard2-way lighting connector fromWAGO. Colour: grey. Continuous service temperature 105°C. Manufacturer's part224-112. Depth 20.5mm. Width 9.5mm. This connector allows for solid, stranded and fine stranded cables to be connected together without the need for any tools. Compact splicing connector. Solid & Stranded Conductors: 0.08-2.5mm2, Fine Stranded Conductor: 0.08-4mm2. 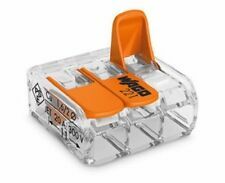 WAGO's new "superstars" for electrical installations allow solid, stranded and fine-stranded wires to be connected faster, more reliably, while minimizing the amount of space in junction boxes. Up to 40% smaller less space required than for the original WAGO 222. 10 X GENUINE WAGO 222-412. 2 LEVER ELECTRICAL CONNECTOR REUSABLE 32A. SUITABLE FOR ALL TYPES OF CABLE, WIRE & FLEX. These are new and still in the original factory sealed box. You are buying one box. We will respond within 24 hours. WAGO 221-415 5-Way Compact Lever. operatung temperature 85°C. 2 X GENUINE WAGO 221-415. 5 LEVER ELECTRICAL CONNECTOR REUSABLE 32A. SUITABLE FOR ALL TYPES OF CABLE, WIRE & FLEX. WAGO's new 'all-around' connector is smaller and even more user friendly than its successful predecessor, the 222 Series. Minimize space consumption in the junction box by 40% compared to 222 Series. Connect any combination of solid, stranded, and flexible copper wires faster and more reliably. Raise the connectors lever to release tension in the wire port and when the lever is lowered it provides adequate tension to hold the wire in place. 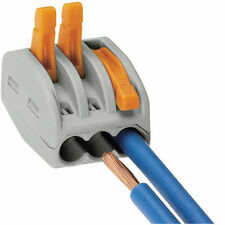 The WAGO Series 222 5-Wire Spring Connector 300V 32A Grey/Orange is the easiest way to connect and disconnect cables and wires. Nominal current 32A. 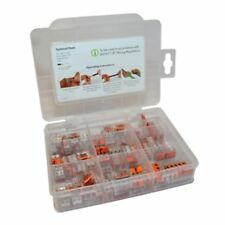 Connector can accept solid, stranded and flexible conductors - no tools required. 100 X GENUINE WAGO 221-412. 2 LEVER ELECTRICAL CONNECTOR REUSABLE 32A. SUITABLE FOR ALL TYPES OF CABLE, WIRE & FLEX. WAGO 221-412 2-Way Compact Lever. operatung temperature 85°C. Wire Size AWG Max: 12AWG. Significant cost savings through the reduction of panel space, smaller enclosures & junction boxes. Conductor Area CSA: 4mm². Kit of the new style 221 connectors, you will receive the following:-.  Wire range--solid: 0,2 – 4mm².  Wire range--stranded: 0,2 – 4mm².  Wire range--flexible:0,14 – 4mm².